Garlic is one of my favorite ingredients – does anything smell better than garlic sauteing in butter? I decided to create an old favorite for this post – white gazpacho. My grandmother almost always has a pitcher of this in her refrigerator over the summer – very convenient for me as it is easy to become a white gazpacho addict. This delicious recipe comes from cook, author, and King Arthur Flour blogger PJ Hamel, who clipped it out of a newspaper ages ago. 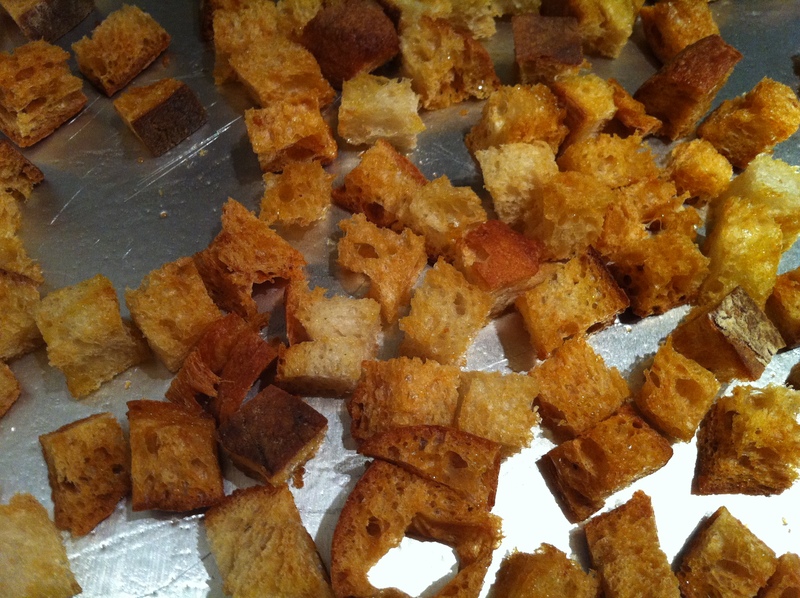 Start by making the croutons – these are sooooo much better than any you will find at the grocery store. Preheat your oven to 350°F. 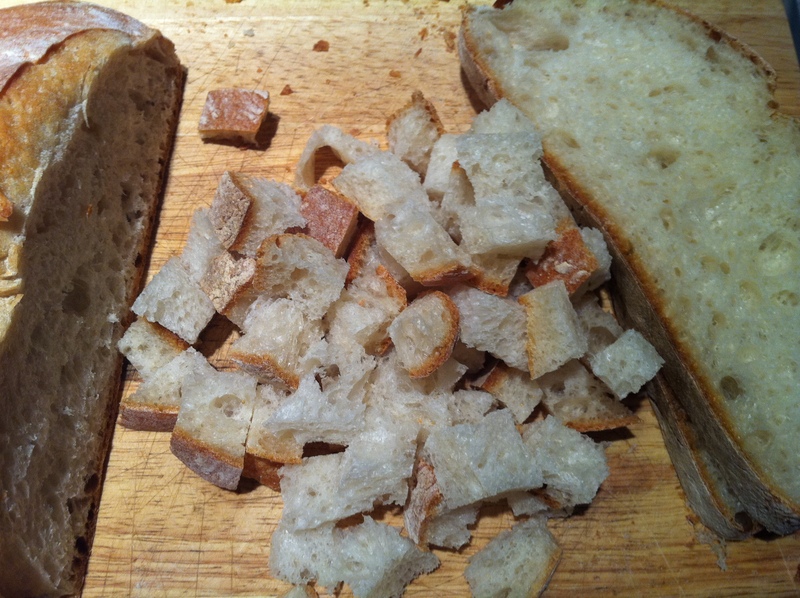 Cut a loaf of bread into small cubes. Place them on a sheet pan, drizzle with olive oil, and toss to coat. Bake them for about 30 minutes or until they are crisp and golden brown. Meanwhile, soak the 10 slices of bread in some cold water. 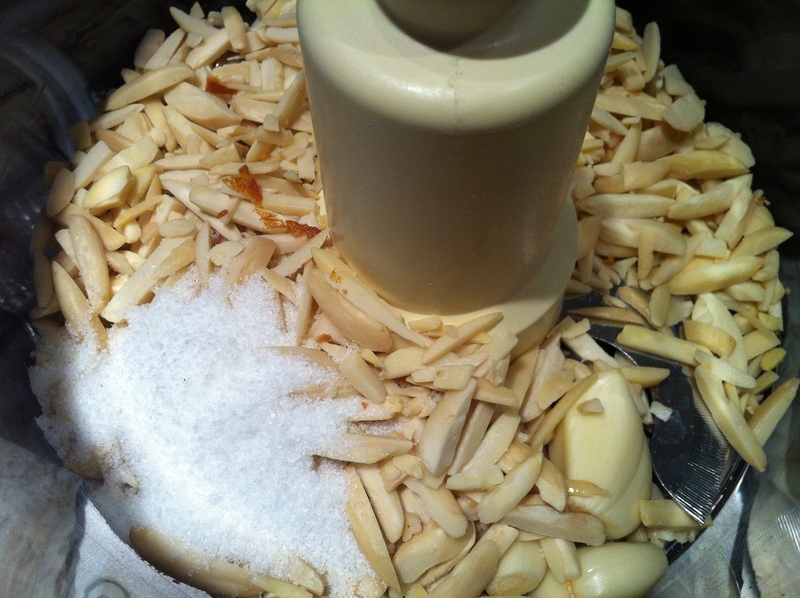 Place the garlic, salt, and toasted almonds (you can toast them in the oven with the croutons) in the bowl of a food processor. Process until smooth. 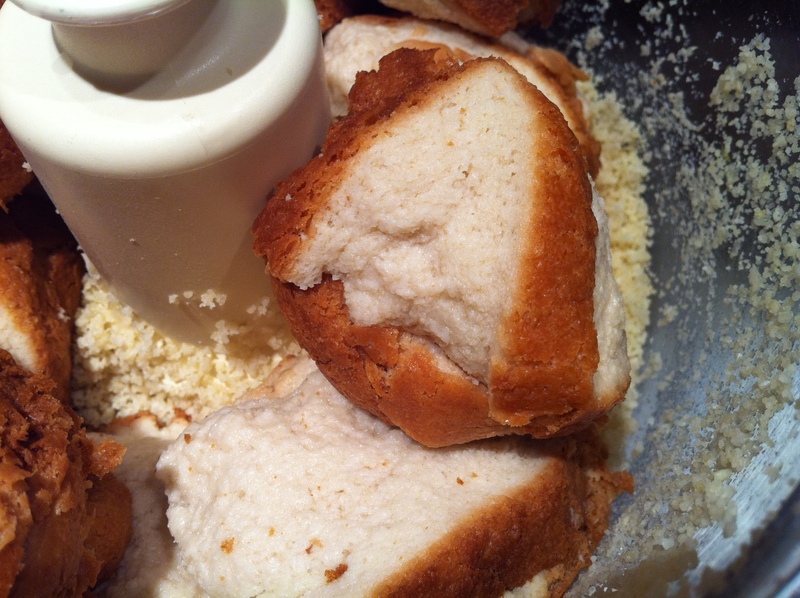 Then squeeze all the water you can out of the bread slices and add them to the almond mixture. Process until the mixture resembles a thick paste. Then transfer to a large bowl, and whisk in the stock/water until it is smooth and creamy. Chill in the refrigerator until ready to serve. 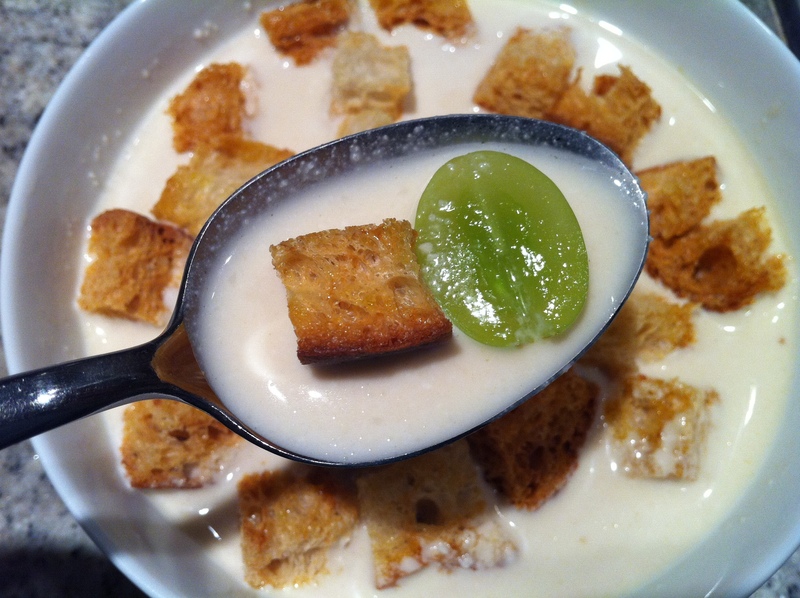 Garnish with halved green grapes and croutons – it is ideal to have one grape and one crouton in ever bite. This soup is filled with a multitude of fantastic flavors – after trying it once you will start to crave it, it is seriously addictive. It is so smooth and creamy, no one will believe there isn’t buckets of cream in it! I now need to take several showers / brush my teeth a few more times… garlic is radiating from my pores! This entry was posted in Garlic and tagged almonds, bread, croutons, garlic, grapes, olive oil, red wine vinegar, white gazpacho. Bookmark the permalink.